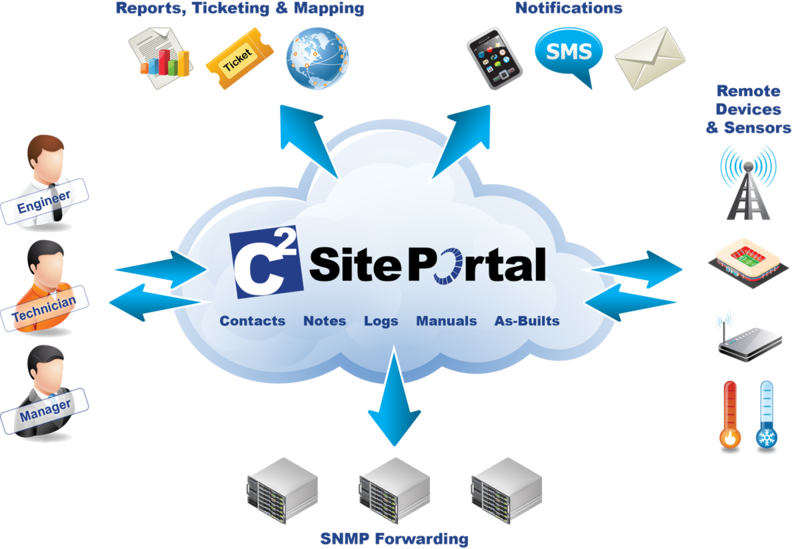 SitePortal® by C2 Systems is a web-based network management system (NMS) for remote monitoring and management of large-scale, complex multi-vendor DAS Networks, distributed systems, and Small Cell and Macro Networks. A single, easy-to-use web tool stimulating improvements in efficiency and productivity – all devices managed from the same platform that is centralized and controlled. Remote site monitoring with Enterprise-wide visibility of system configuration, time in alarm, changes, and more; all organized by market, vendor, etc., to ensure best practices and track accountability. Configuration management that aids in troubleshooting allowing users to make updates remotely and automatically track these parameter changes for future audits and trend analysis. Automatic collection of variables such as power levels, fiber losses, operating temperature, etc., to significantly reduce time to repair a system. The ability to assign custom alarm thresholds to the variables provides proactive maintenance to prevent a complete system outage. Data storage capability for items like as-built drawings, equipment manuals, firmware, etc., to reduce time spent looking for critical documents needed to respond to a problem. Remote troubleshooting and control of the devices to reduce costly OPEX dispatch expenses (all through administered access policies with tracked changes). For DAS, Small Cell, and Macro Cell Monitoring this product has many advantages over SNMP monitoring software, simple trap receiver or contact closure alarms to manage growing critical systems, and improves customer satisfaction. One of the largest wireless carriers in the United States was looking for a monitoring and maintenance tool. They needed a solution that was flexible and capable of meeting future demands. SitePortal was initially deployed in one market on a trial basis. The carrier quickly realized that the robust capabilities of SitePortal as a monitoring tool was a necessary solution for managing their network. Today, SitePortal is used by the carrier across the U.S. and is monitoring thousands of sites and systems while providing users with enhanced visibility into deployed devices.